Paddock Mall in Ocala is a local indoor mall, primarily for Marion County residents. The anchors are JC Penney, Sears and Macy's. They have your typical mall stores and a ..
Best Italian food in Ocala. Great sauce and noodles! 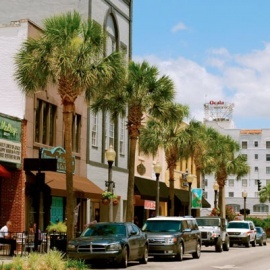 Ocala is best known as "horse country" featuring hundreds of horse farms and rolling green pastures. It's home to the Ocala National Forest where you can enjoy hiking, biking, kayaking, bird watching and other outdoor activities. Ocala and surrounding Marion County have some of the most beautiful freshwater streams and rolling hills and have been featured in Hollywood movies. Silver Springs State Park is one of Florida's most treasured landscapes. It's one of the largest artesian springs ever discovered. Enjoy glass bottom boat rides, kayaking and canoeing and all the beautiful views 365 days a year. Looking to change the typical "dinner and a movie" date? Ocala has a lot of fun things to do for dates just waiting for you and your sweetheart to find! Itâs holiday party season and New Year's Eve is the biggest night to go out and celebrate! As 2017 comes to an end, dance the last of the year away at one of these New Year's Eve in Ocala events.